Every year, my husband and I go on an anniversary trip. We take turns choosing the destination and this year my husband chose Paris, France. Part of his reasoning for choosing Paris was so that he could hear me speak French. ?? This year, we opted to rent an AirBnB instead of getting a hotel room. We'd never done that before, but decided to try it. I was convinced by a pilot while I was on a 40-hour layover in Paris. I found an adorable little studio apartment just outside of Montmartre, close to the Métro, and close to a main road (meaning supermarkets, pharmacies, etc.) I'm SO GLAD we chose AirBnB over a hotel. First of all, we spent half as much on the studio than we would've for a hotel room. Secondly, the studio had a small kitchen with two burners, fridge, sink, and microwave. So, we could cook meals there. I loved that feature, being a person that doesn't like dining out for every meal. Thirdly, we didn't have to bother with housekeeping or other hotel guests. It was just us. The owners of the studio lived next door, but a few days into our stay, they left on holiday. For a week, we got to feel like Parisians. One of the best parts of taking a trip is trying local food. I'd fielded some recommendations from friends before leaving and now have a wealth of places to try in and around Paris. The owner of the studio also left us a list of many great restaurants around the area. 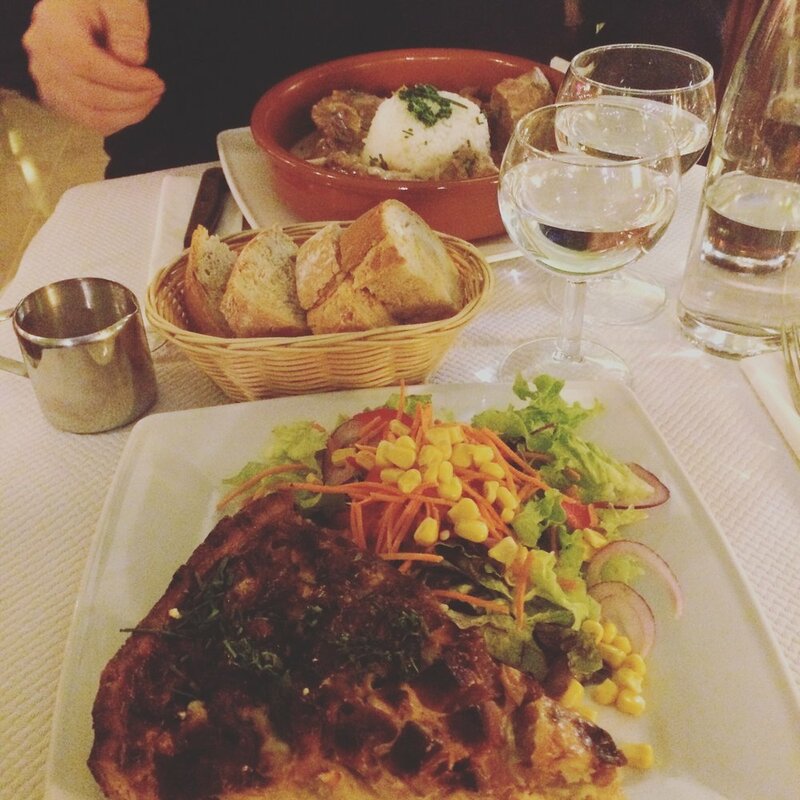 The first restaurant we went to was L'Été en Pente Douce(TripAdvisor / Yelp), a colourful space serving classic French food just a short walk away from Sacré-Coeur. I'm glad we went here for our official anniversary dinner. It's a quaint little restaurant with lots of colour, a cat who seems to be a frequent visitor, and delicious food. It's quiet, far from the touristy parts of Montmartre, which was nice. I ordered the Quiche Berrichonne (quiche with bacon, Emmenthal cheese, and onions) and my husband ordered the blanquette de veau (veal stew). We might've waited forever for our food (it's France, so, yeah. I'd prepped my husband on the difference between American and European serving standards), but it was well worth it. Just look at that food! A favourite restaurant of mine is Le Relais de l'Entrecôte. You know a place is good when the only questions they ask you are: "How would you like your steak cooked?" and "What would you like to drink?" I'd been talking this restaurant up so much - I'm glad my husband liked it! The steak is cooked to order and served with shoestring frites and this green sauce. It's so good. I have no idea what's in the sauce, but it's amazing. Order a bottle of wine and enjoy. A line usually forms about half an hour before it opens for dinner, making it popular. It's a bit more expensive and the seating can be tight, but the food is worth it. One of the best decisions we made was to book a day trip from Paris to Normandy. We got up at zero dark thirty to take the metro and meet the group at the Trocadéro. From there, it was a 3.5 hour minibus ride to Normandy. On the itinerary that day: Utah Beach, cidre and calvados (apple brandy) tasting, lunch, La Pointe du Hoc, the American Military Cemetery, and Omaha Beach. I learned so much about D-Day and WWII during this day trip. Our tour guide (a professor at a Parisian university) gave us a lot of insight into the intricacies of the different operations carried out on D-Day. It intrigued me so much that I bought a book on WWII at Shakespeare & Company the next day. 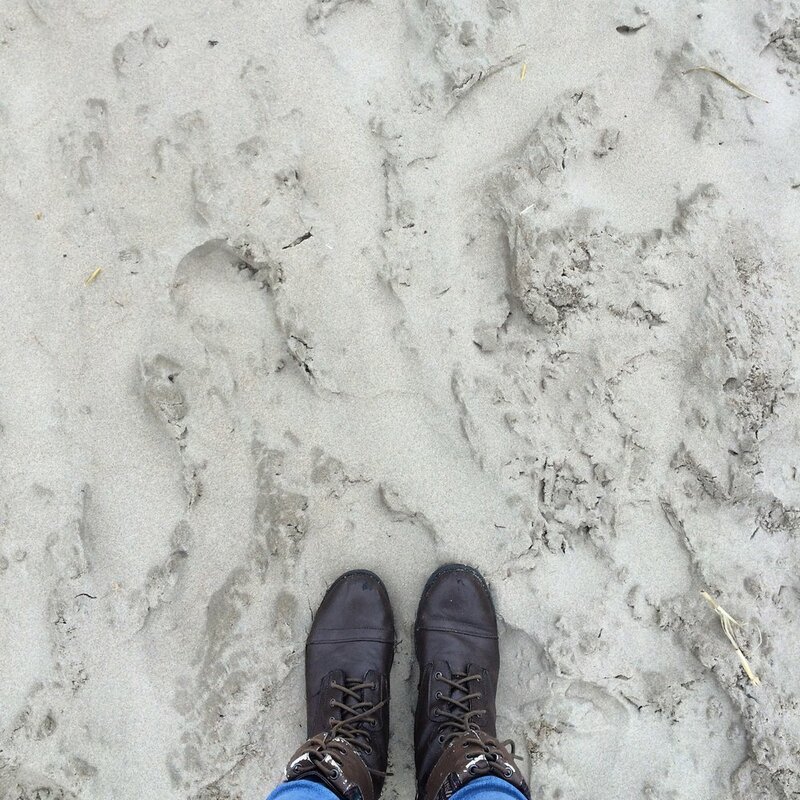 I stood on Utah Beach after going through the little museum there and took in everything. I looked down and realised that I was wearing my "combat" boots, now paling in comparison to the actual combat boots that came down on Utah Beach in a valiant effort to breach the Atlantic Wall and stop the growth of the Nazi regime. It was a sobering moment to say the least. La Pointe du Hoc was eye-opening as it was left just as it was on 6 June 1944. There are huge craters all over, caused by bombs launched by the Allies. Some of the German artillery bunkers are still standing and are fully accessible to the public. Some are partially or completely destroyed. Looking at the cliffs, it's almost impossible to imagine the Army Rangers scaling this cliffs. 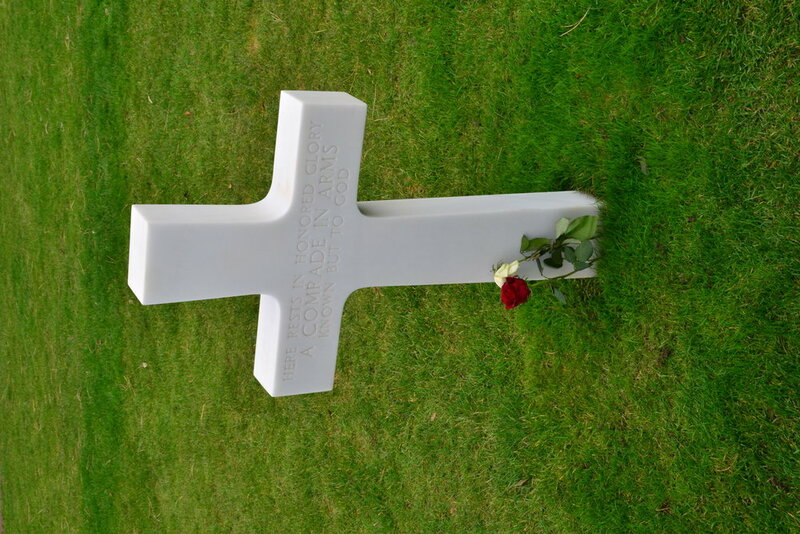 The American Military Cemetery was also sobering. Seeing perfect rows of crosses and stars of David causes one to stop, reflect, and pay respects. Some of the crosses/stars of David have "Here rests, in honored glory, a comrade in arms known but to God." We arrived at the cemetery in time to hear "Taps" played over loudspeakers as workers took down and folded the flags. 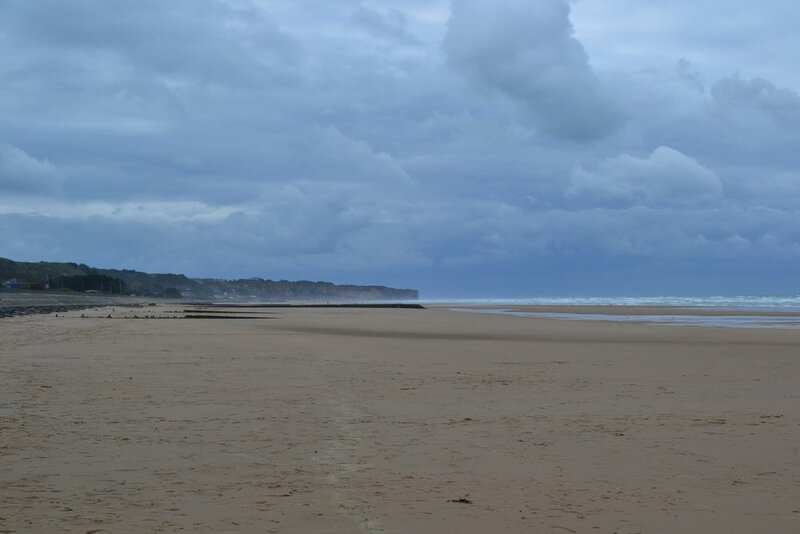 Omaha Beach. It's huge. It's hard to imagine the struggle of the troops who landed there on D-Day. It's a beautiful beach. And it has several memorials dedicated to D-Day. The strange thing is, people use it as a vacation spot. People use Omaha Beach as an actual beach beach. There are little cabins where people stay when they're visiting. I couldn't do it. Normandy was worth it. I wish we could've spent more time up there - it's gorgeous. I came back to Paris a lot more knowledgeable about WWII and D-Day and thankful for the sacrifices that we made that day. Eiffel Tower: If you don't buy tickets in advance online but still want to go, get there early. We arrived at 08:00 and the ticket kiosks open at 09:00. Lines form quickly. You can also go later at night, as lines tend to dwindle in the evening. If someone approaches you and asks you to sign a piece of paper for whatever reason, don't do it. They're pickpockets looking to distract you so that someone else can swipe something from you. Go all the way to the summit (sommet). The view is worth it. The Louvre: Buy Paris Museum Passes if you plan on visiting more than one attraction covered under the cost. Most of them will allow you expedited entry. We skipped an hours-long line at the Louvre because we had bought these passes. The Louvre is massive. Seriously, it's an all-day event. It's a lot of walking, stairs, and art. But it definitely worth it to see the Mona Lisa (La Joconde), the Code of Hammurabi, and Napoleon III's apartments. The Louvre does have adjoining cafeterias and restaurants. There is a McDonald's (McDo) if you're craving familiar food :) (We ate there because we'd been at the Louvre for five hours and were tired and hangry). Sacré-Coeur: Beautiful church in Montmartre. I'd recommend going at night. It's lit up, less crowded, and gorgeous. Go inside if you visit during the day. Notre-Dame: Admission is free and there's usually a huge line. The line moves fairly quickly, though. Go in there, sit, and let the weight of history rest upon you. It's over 800 years old. Take in the breathtaking Gothic architecture. Mémorial des Martyrs de la Déportation: This memorial is to the 200,000 deportees from France to concentration camps during the Holocaust. It's located just behind Notre-Dame. Entry is free. It's a solemn reminder of the horrors of the Holocaust. Interred there is an unknown deportee who died in the Neustadt camp. There are 200,000 lights in there to represent each one of the deportees. It's a heavy experience, emotionally and mentally, but worth it. 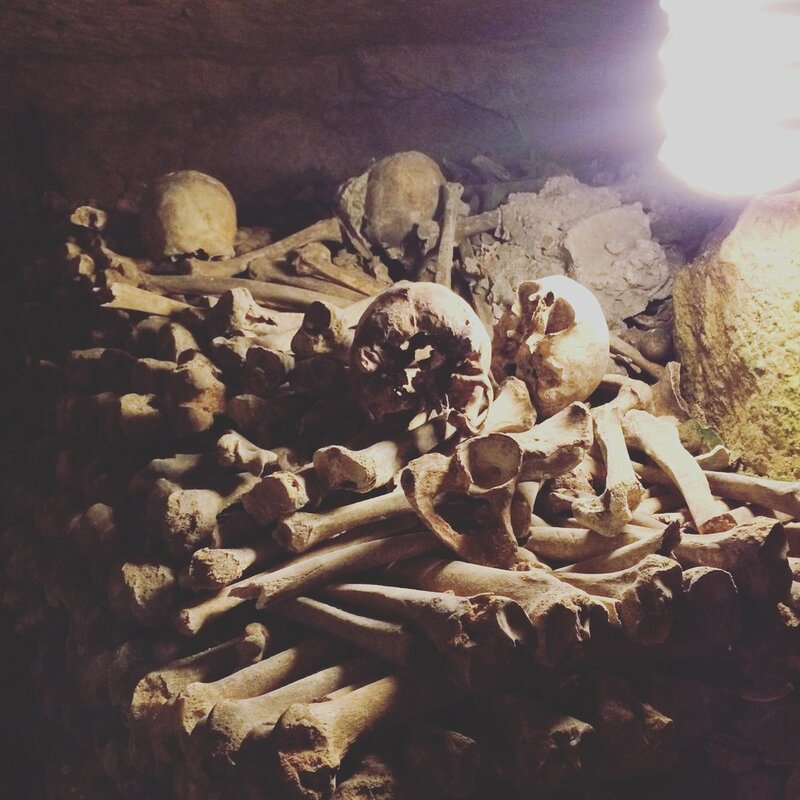 Catacombs: Definitely get here early. We were bums on this day and got there at about 11:00. We waited in line for nearly two hours. 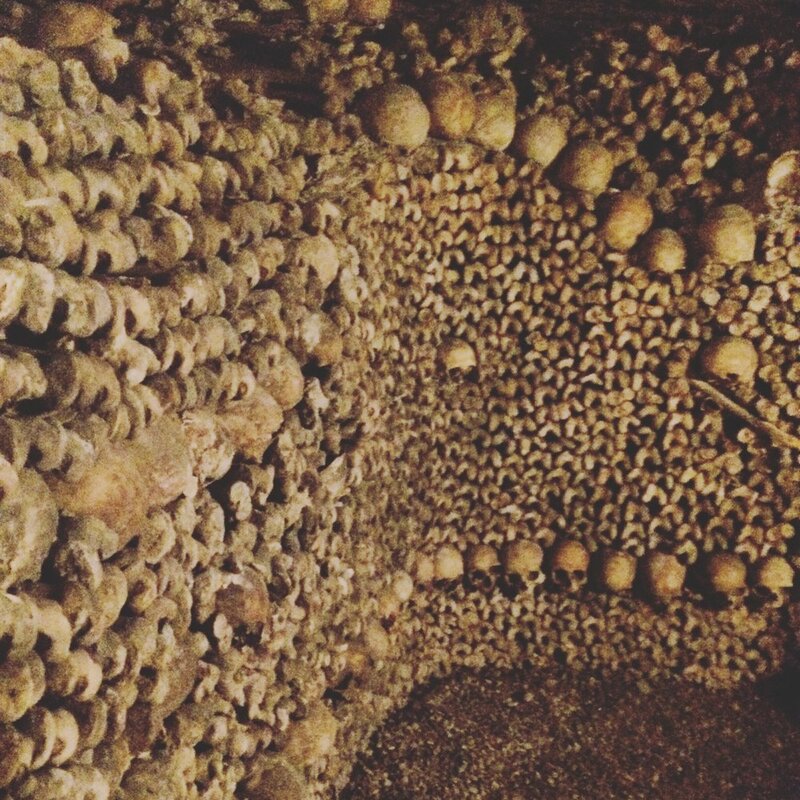 This experience is especially macabre as you're walking past millions of bones. But it'll add a neat twist on a typical visit to Paris. It's a lot of stairs and walking (130 steps down, 85 steps up, 2km covered). It can invoke feelings of claustrophobia or anxiety if you're prone to those. To me, it wasn't that bad. The ceiling is a bit low at times, but nothing caused me to get anxious. Arc de Triomphe: I'm slightly embarrassed to say that I had no idea you could go on top of the Arc until we actually did it. This was covered under the Museum Pass, which allowed us to skip the long line. Again, a lot of steps up and down (we did this right after the Catacombs...oops! ), but it gives a beautiful of the Champs-Élysées and the rest of Paris. There are little exhibits in the different levels of the Arc. And that wraps up our trip to Paris! If you go, drink a café crème and eat a crêpe for me!